After honing in on their sound with 2013's Youngblood, Norwegian band Audrey Horne has released a new album in the same vintage vein, Pure Heavy. While guitarist Ice Dale has his roots with the black metal band Enslaved and guitarist Thomas Tofthagen has played in the doom metal band Sahg, the members of Audrey Horne have come together to create a completely different sound with a classic rock and New Wave of British Heavy Metal (NWOBHM) origin. Pure Heavy introduces itself with the track "Wolf in My Heart". The guitar riffs, the rhythm, and even frontman Toschie's vocals really sound inspired by The Who. Underlying heavier rock riffs give this song some metal overtones. The lead single from Pure Heavy, "Out of the City", will instantly remind listeners of Thin Lizzy. It has a defined '70s rock feel, and the bass line screams Phil Lynott. This sound comes quite organically from Audrey Horne. It doesn't sound at all like they're trying too hard to sound like Thin Lizzy. This song about leaving town--something a lot of us dream of someday doing--has a sing-along chorus of, "Oh I know, oh I know, oh I know, we're getting out of the city!" "Out of the City" is accompanied by a fun video, in which Johan Hegg of Amon Amarth makes an appearance. It also has puppets, because what's more metal than puppets? "Into the Wild" seems to have a ton of Mötley Crüe influence--Espen Lien's drumming and cowbell, the guitar riffs, and the rhythm. The vocals, however, are a bit more on the Van Halen/David Lee Roth end of things. If you like the Crüe's "Live Wire", you'll love this song. The rest of the songs from Pure Heavy fit into what I like to call a "NWOBHM-meets-KISS" sound. "Holy Roller" exemplifies this. It has some great heavy riffs, and it is catchy, especially when "Holy roller!" is sung in the chorus. It also has this subtle pinball or alarm type sound that is in the background. It's one of those things that will kind of catch you off guard when you're listening to the song and driving or something. "Holy Roller" is one of tracks that stand out on the album for sure. "Volcano Girl" goes along with this sound, and I absolutely love Kjetil Greve's heavy bass playing on this one. It has a driving rhythm and a great NWOBHM style guitar solo. The "wooooaaaah" in the backing vocals is a lot of fun. "High and Dry" (no relation to the Def Leppard song) has some great Iron Maiden-esque guitar riffs, and it also goes along with the NWOBHM trend. Pure Heavy ends with the track "Boy Wonder". It fits with the classic metal style, but it is a bit darker, weighty, and looming. Audrey Horne's Pure Heavy is fantastic all around. It has several stand-out tracks, particularly the ones at the top of the album. I thoroughly enjoyed last year's Youngblood, and Audrey Horne has stayed with me ever since. While I still think the individual songs from Youngblood stuck with me more and grabbed me a bit sooner than this batch did, I find that these songs really grow on you after a few listens. 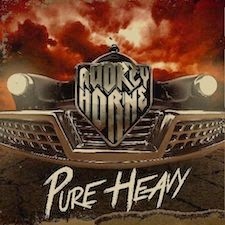 For anyone who is into '70s and '80s-era classic rock and metal, Audrey Horne is a band you should be watching, and Pure Heavy is a must have for your album collection.